Remember when you promised yourself on December 31 that you’d finally start hitting the gym in the new year? While you may have been full of festive cheer when you said it, the knowledge that we’re now halfway through the year is sure to make you feel a slight pang of guilt, especially if you’ve recently stood on the scales and realized you haven’t made a change at all. However, it’s never too late to make your resolution a reality. The tips below will help you get back on track to becoming your best self. Hiring a personal trainer in Caroline Springs or your nearest town can benefit you in so many ways; not only can they set you on the path to success, but they also provide you with the motivation to get off the couch and be active. If you’re exercising and training alone, you may tell yourself you’ll begin tomorrow, which could have been weeks ago! Plus, when you know you have to be somewhere at a specific time, you’re more likely to make an effort. There’s no time like today to hire a trainer and get your goals back on track. The sad reality is that less than three percent of Americans live a healthy lifestyle. If you’re trying your hardest to be a part of that group, you may need to make some changes to your diet. While you may be exercising, it’s possible you might not be seeing the results you want because you’re eating the wrong foods. Therefore, don’t be afraid to begin a meal plan, which involves plotting out healthy options for your breakfast, lunch, dinner and snacks to start seeing results from your exercise regime. In three years, the popularity of fitness apps has grown by 330 percent. The reality is, we live in a digital age where apps and devices can help to motivate us, track progress, and set us on the road to success. While they’re never going to be as helpful or persuasive as a personal trainer, apps are a brilliant way of tracking how much you’ve exercised, your caloric intake, milestones, and even your heart rate and sleep patterns. 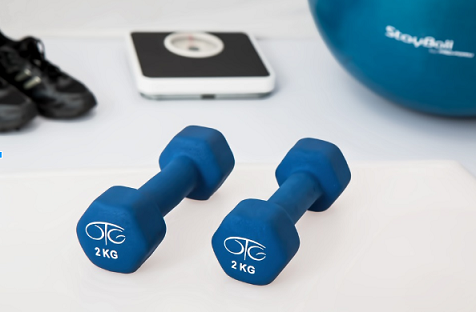 A lot can change in the time from when you made a vow to get fit and healthy all those months ago, so before you go ahead and begin rigorous exercise either with a trainer or by yourself, it’s a good idea to see your doctor. If you haven’t had a physical check-up in some time, get the big green tick from a medical professional before altering your lifestyle. As a result, you won’t be able to make any excuses about aches, pains, and illnesses while you’re working hard! There are a host of advantages to working out with other people, which is why it makes sense to join a class or exercise with your friends rather than going down the hard road alone. Studies show there are many benefits to buddying up with people to get fit, including better success rates of finishing exercise programs, higher weight loss rates, and the ability to work harder for longer. Research has even found that those who have competitive streaks see far better success when paired with someone else. You may have forgotten about your New Year’s resolution to get fit and healthy, but your body hasn’t. It’s not too late to start achieving your goals, so get started on the tips above to make your new healthy lifestyle a reality.